I read a lot of forums about the care of cats, because I want to look after mine the best I can. A lot of them say that fresh water is better for cats then water sitting in a bowl, so I found a great looking small pet water fountain. They love boxes so both watched me open the box, then sniffed each part and watched me wash everything. When it was put together and water was added they just sniffed at it. As soon as the power went on and the water started to run, they both backed up a couple of steps and just watched it. Both watched for an hour. Alex was the first to get close, putting her paw underneath the fountain. Then dip her paw in the water. This carried on for over an hour, Paw in, shake the water off, and run away. They realised that they could drink from it, now they are drinking from all the levels of the fountain. They seem to love it. 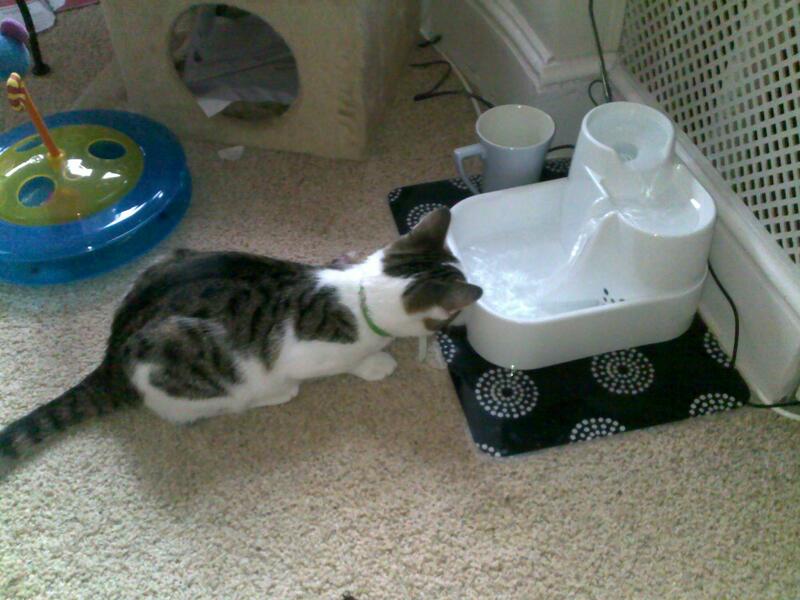 This entry was posted in Cat and tagged Cat, Cat Mate fountain, drinking water. Bookmark the permalink.